In this blog I will be taking you through a proof of concept which I have done to leverage ZooKeeper’s configuration management service to run different (or same) automated tests in parallel on different test machines in a network. Before starting with the POC, let’s do a quick overview of ZooKeeper and some of its features which we require to understand the POC. Apache ZooKeeper is an open source co-ordinated service for distributed applications. It runs in java and provides APIs in Java and C. These APIs helps in designing synchronization, configuration management and grouping and naming services in a distributed application. While designing a distributed application we have to worry about centralized configuration, synchronization, serialization. Also, there are problems that are intrinsic to distributed applications –e.g. Partial failures, Race conditions, handling of sessions timeouts retries etc. ZooKeeper is there to take care of all these difficult stuff, so that one can focus on functionality. ZooKeeper service runs on odd number of network machines. This is called ZooKeeper cluster (or ensemble ). Once running, the ZooKeeper service will choose a leader. Both leaders and followers can get connected to clients. From a very high level think of ZooKeeper as a centralized repository where our distributed applications can store data and read data. Reads can be from any of the ZooKeeper server nodes (whether leader or follower). But all the writes go through the leader. Inside a ZooKeeper i.e ZooKeeper’s data model is a hierarchical namespace like a filesystem with just directories. These directories are called Znodes. Znodes can store data (only upto 1 MB) and other Znodes. The reason why znode can store 1 MB of data because it’s not designed to work as a database, all we need to store is small amount of information to share between distributed application. Persistent – These znodes always remains there. We don’t want that node to leave unless explicitly deleted. Ephemeral – These are session specific nodes, when the session of the client which created them is over, these nodes are automaticlly deleted. Persistent_Sequential – This is a hybrid of persistant and sequental node type.A sequential Znode is given a sequence number by ZooKeeper as a part of its name. The value of a monotonicaly increasing counter is appended at the end of name. Ephemeral_Sequential – This is a hybrid of Ephemeral and sequential nodetypes. A znode is created or deleted. A child is added or deleted to a znode. The read operations (exists, getChildren and getData) may set watches. The watches are triggered by write operations create, delete and setData. Watch set on exists operation will be triggered when the znode being watched is created, deleted or updated. Watch set on getData operation will be triggered when the watched znode’s data is updated or znode is deleted. Watch set on getChildren operation will be triggered when a child of znode is created/deleted, or the znode itself is deleted. To discover which child node has changed or what data on znode has changed, notified client should call getChildren or getData. In both these cases state of znode might have changed between receiving the watch event and performing read operation. Such cases should be handled by programmer himself. It can be used to be notified of changes in ZooKeeper state (connecting, connected or closed). The default watcher passed into the ZooKeeper constructor object is used for state changes. It can be used to be notified of changes in znodes as discussed above. Znode changes may either use a dedicated instance of Watcher or It may use the default watcher if we use the form of read operation that takes a Boolean flag to specify whether to use a watcher. – Machines will be registering themselves as test running machines. on which test machine to run. – Only one test can be scheduled on a test machine at a time. – User should be able to control (Pause, resume, stop) a running test on machine. – Negative scenarios should be safely handled e.g. User should not be able to schedule test on a machine which is not online. User should not be able to perform invalid state transitions e.g. from Start -> Resume. For simplicity’s sake, in our POC we will be running a Selenium webdriver test which will invoke a search engine website (Google/Bing) on the Chrome/Firefox browser, will search for “Three Pillar global” and count the number of search results. Test machines will be ZooKeeper clients. Registration request will be a ZooKeeper connection request. Upon registration, the test machine will be creating a znode with the hostname of the machine under the root node as – /zoo/NDI-LAP-253. Data on this node will be null, till no test is scheduled. Using ZooKeeper’s NodeDataChanged event type watch, test machines will be notified when any new test is scheduled on the or there is any state change e.g. from Start -> Pause. Once the test is complete on test machine, client will automatically nullify the configuration data on corresponding ZooKeeper node. Test schedulers will be ZooKeeper clients. Test scheduler will be able to schedule test by specifying three mandatory parameters – which online test machine to run, what test to run and what browser to run. Internally test scheduler will update the configuration data in test machine’s node to – ‘testName|browser|START’. 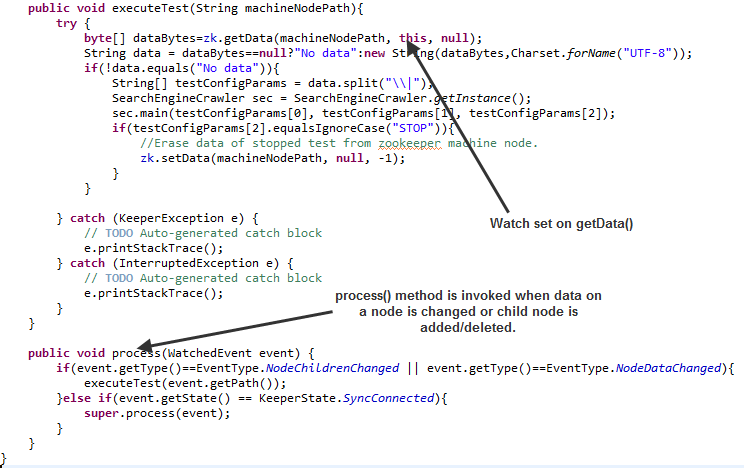 Test machine will in turn read this data through the ZooKeeper callback (watches) and invoke the test on asked browser. Till the time test machine node is having a non-null data, test scheduler can’t schedule a new test. Once the test on test machine is complete, test runner machine will remove the configuration data from its corresponding znode and hence Test schedulers can schedule further tests. Test controllers will also be ZooKeeper clients which will be able to pause, resume and stop an already running test on a test machine. Internally, the test controller will update the configuration data on a test machine znode. The test machine will receive the updated configuration data and accordingly stop, pause, or resume a test. 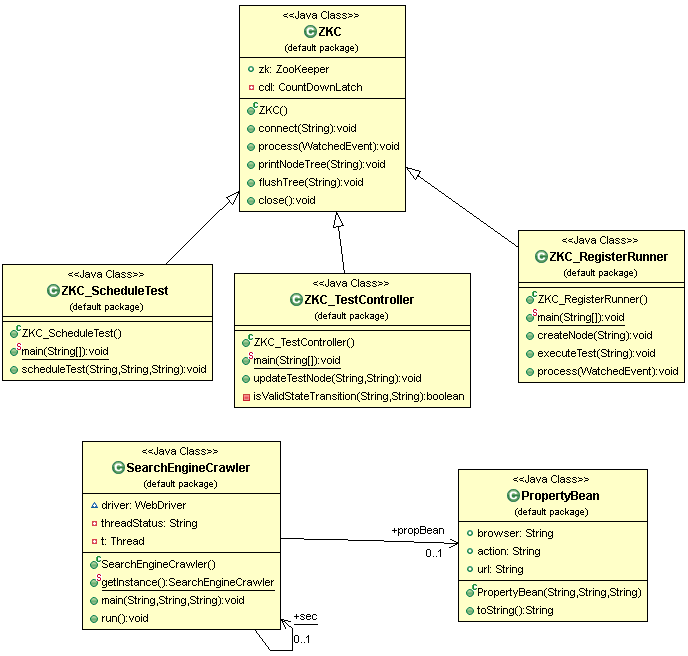 All the validations related to test machine name, whether the state transition is valid or not will be done at client (Test controller) level before updating the znode data. Once the data is updated, how to stop, pause and resume a test that implementation will be done in classes responsible for execution of actual test (in this case Webdriver test). We will be using three ZooKeeper client nodes. Test runner machine – 1. Test runner machine – 2. For demo, we will be using test scheduler/controller machine as ZooKeeper server too. So this machine will be working both as ZooKeeper host and client. 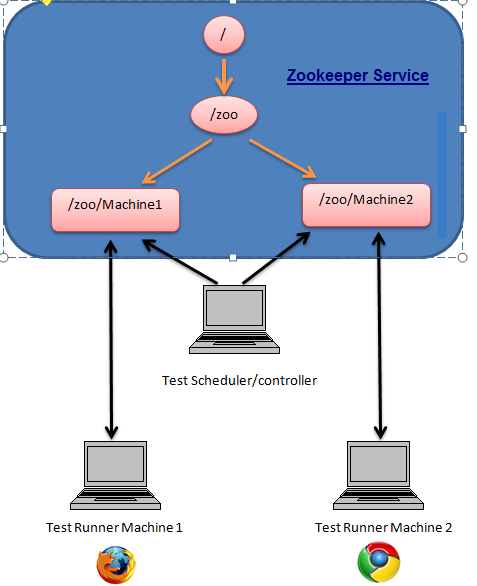 Run the ZooKeeper server on Test scheduler/ controller machine. Navigate to bin folder of resources folder using command line. Perform the same step on test runner machine 2. NDI-LAP-253 – is the ipaddress/hostname of test runner machine 1. Firefox – is the browser on which to run the test. URL – is the URL under test. After the above step, test should be running on test runner machine 1. We can pause, resume stop test running on test runner machine 1 by following command on Test controller (same as scheduler) machine. Prashant Ujjwal is designated as a Module Lead – Quality Assurance at 3Pillar Global. Prashant has a total work experience of 6 years in the field of software testing out of which 5 years has been in automation testing. Prior to joining 3Pillar, Prashant has worked for companies like Accenture and Indicomm Technologies. His area of interest is in the field of distributed computing and big data solutions. Nice blog providing insights of Big data utility . I have a system that has different components, I want to simplify things. Can please tell how zookeeper can help me coordinate between several application in different Linux and Windows boxes ? Explanation with diagrams is what I liked about this post…Well explained !!! very nice blog, Actually cleared my lots of doubts.!!! Its really a well written piece on zookeeper.loved it!! !